Second tier FX volumes showed gains in January, led by Fastmatch which reported a+24.3% rise to $11.8bn/day, whilst Hotspot reported a +7.1% gain. 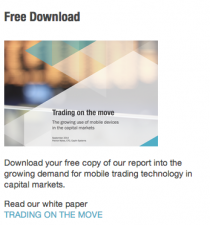 The top-tier FX platforms have now released their Jan 2016 volumes. The Bank of England today released their latest semi-annual FX turnover survey results for Oct 2015. Total FX volume of $2,148bn/day, down -13.4% compared to Apr 15, and down -21% compared to a year earlier, and the lowest volumes since Oct 12. BofE study finds mandatory swaps trading on SEFs increases liquidity and lowers costs! Some interesting findings from a paper from the Bank of England, which looked at the impact of mandatory trading on swap execution facilities (SEF), for interest rate swaps (IRS) as required under Dodd Frank Act. “The improvements in transparency brought about by the Dodd-Frank trading mandate have substantially improved interest rate swap market liquidity. Finally, the report finds that the Dodd-Frank mandate caused the activity of the EUR segment of the market to geographically fragment. However, this does not appear to have compromised liquidity. Thomson Reuters FX dealer-to-client venue saw a surge in options trading volumes of 166 percent in 2015 compared with the previous year. In particular the fourth quarter of 2015 saw record-high monthly, weekly and daily volumes with over 36 global and local active options price-makers and more than 225 active options price-takers now on Thomson Reuters FX platform. Thomson Reuters FX Trading provides both relationship trading (bank-to-client) and bi-lateral trading (interbank) for vanilla and exotic FX options. In recent months the company has introduced electronic FX options callouts to streamline how banks can access options liquidity in the interbank market. By providing one single point of access to options liquidity via electronic callouts or via Thomson Reuters FXall dealer-to-client request-for-quote service, FX Trading helps market participants to efficiently manage their trading risk. The CLS FX settlement system has reported a slight increase of +1.4% in the ADV of FX trades settled through their platform in Dec 15, taking volumes back up to $4.47trillion/day (up from $4.41trillion/day in Nov 15). This is the lowest on the platform since Aug 2013. In terms of number of transactions settled, these were almost unchanged at 961,698 in Dec 15, although they are now at their lowest level since Jul 14. CLS value of instructions submitted: $4.47 trillion/day in Dec 15, up +1.4% on the $4.41 trillion/day in Nov 15, although down -8.2% compared to Dec 14. CLS number of instructions submitted: 961,698/day in Dec 15, down -0.3% on the 964,810 in Nov 15, and down -21.4% on Dec 14 level of 1,223,109. Average Trade size: $4.65mln in Dec 15, up +1.7% on the $4.57mln in Nov 15 and up +16.7% compared to the $3.98mln in Dec 14. Note: CLS reports both sides of an FX transaction. To adjust the average daily value data to equate to the same reporting convention used by the Bank for International Settlements and the semi-annual foreign exchange committee market reports, the gross values should be divided by two. 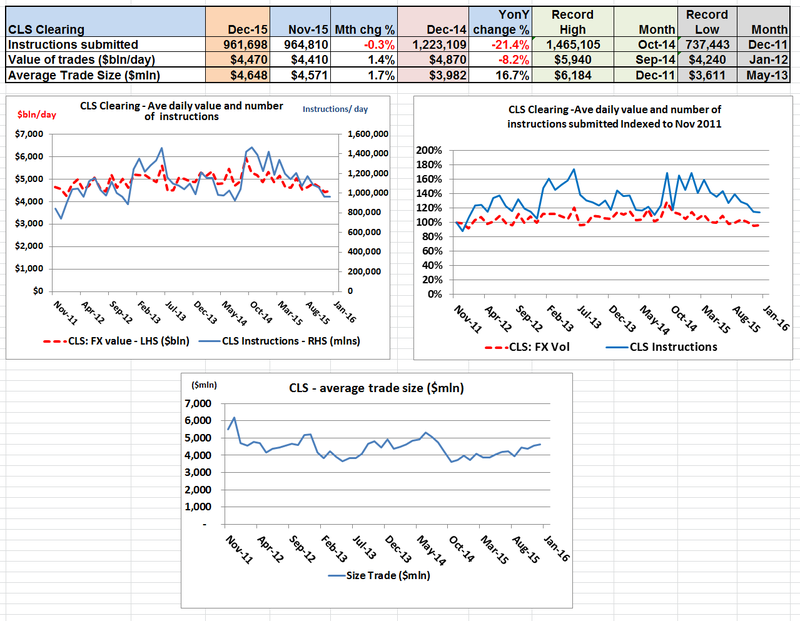 FX Platforms Dec 15: Reuters and EBS almost unchanged in Dec 15, whilst The CME showed strong 24% gain. The top-tier FX platforms have now released their Dec 15 FX vols. In terms of Spot FX vols, Reuters and EBS are barely changed, with Reuters +1.1% at $91bn/day, whilst EBS -0.9% at $74.8bn/day. However, in terms of other products, Reuters showed an +8.8% rise in other product vols, including NDFs and swaps (on their SEF) to $246bn/day. However, The CME Group, had a great end of year, with a strong +24.1% gain in all FX product vols in Dec to stand at $110.6bn/day ($89bn/day in Nov 15). Although given that it’s Dec, we can’t really read too much into year-end figures.